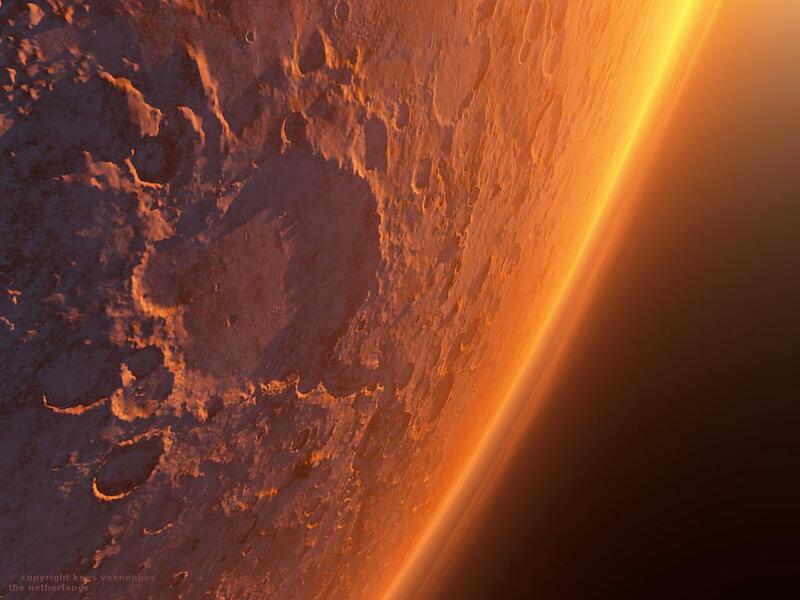 Most mythical images associated with priori-Mars arose from surface features - transient or permanent. Permanent ones remain intact today and have been photographed by space probes orbiting Mars. These are the result of combinations of surface relief, coloration and shadow. Doubtless primitive peoples recognized their resemblance to various animals when priori-Mars orbited close to the Earth. It is only necessary to look at the NASA images of the red planet from a more child-like point of view in order to become aware of these forms. The agreement of the features mentioned in the myths with those we find on Mars today is evidence that ancient peoples observed them with the naked eye. For example, there are two elephantine features, shown in Figure 1 corresponding to two mythical elephants. The first, Airavata, Indra's elephant, is in all likelihood inspired by the shape of the residual south polar ice cap. This white elephant with trunk raised is also the likely source of the oriental notion that an elephantine form with raised trunk is a sign of good fortune. The second elephant image merely shows the head and trunk. This is probably Ganesa, since the myth involves his head being severed from his body. 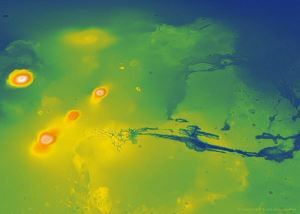 The two images of the Valles Marineris shown in Figure 2 are inverted (north pole at the bottom) because that was its orientation during the dance encounters. 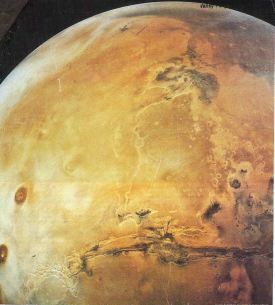 The Valles Marineris is the most prominent feature remaining today and was incorporated into the myths of many cultures. It was described as a great bird in flight, Garuda, in Hindu myth, the 'vahan' or animal which 'carried' Vishnu. As priori-Mars revolved geosynchronously around the Earth, remaining fixed in the sky over the Himalayas, it went through phases like the Moon, gradually disappearing into shadow each morning. This was the source of the Greek myth that a vulture daily tore at the flesh of Prometheus, imprisoned above the Earth. It was also most likely the source of the peacock in Tibetan myth. 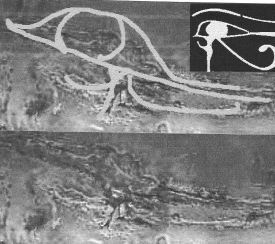 At the end of each ‘dance encounter’ the Egyptians saw the glowing solid core of priori-Mars protruding through the Valles Marineris and called it the’eye of Horus’ or the ‘eye of Ra.’ The hieroglyph for the eye (Figure 3) is an unmistakable reproduction of this feature, except that the core is no longer protruding through it. In figure 3, upside-down images of a horse or bull (lower left) and a monkey (left center) can also be seen. In Hindu mythology, a bull was said to be the vahan of Siva and the Vedic deity Vayu, (later Pavan), the god of wind and noise that comes propelling the dust and making all things ruddy, is said to have had a son, by a monkey mother. The same animals appear in the 'vision' of the biblical prophet Ezekiel, and in the book of Revelations, attributed to the disciple John. Ezekiel saw a creature with four heads. This vision may be a composite of the four headed volcanic feature called Brahma (now collapsed) by the Hindus and the animal features visible today on the surface of Mars. John describes four living creatures around the ‘throne.’ The first is a lion, the second is an ox (the horse), the third has a face like a human being, which may be the figure which we described above as resembling a monkey, and the fourth creature is like a flying eagle. As a result of this and a number of other statements in the biblical Revelations, we suggest that the mythical imagery was meant to reveal the events observed on priori-Mars by ancient cultures during the Vedic period. This leaves open the question as to exactly how much of this last chapter of the New Testament actually has to do with predictions of the future, as is currently supposed. At the left of Figure 4, three circular faults delineate the center of the Tharsis Bulge, giving some indication of the magnitude of its elevation during the Vedic period. Its true magnitude is better indicated by the radial fault system centered on the bulge which surrounds the entire planet. Figure 4, in which the colors indicate the elevation above the datum, gives a good indication of what the Hindu’s called the face of Siva and the Egyptians called Horus. The two outer volcanos, which erupted continuously during the dance encounters, were seen as 'eyes' at night and even during the day. The Tharsis Bulge was the nose (Siva) or beak (Horus). Valles Marineris cut into the bulge giving the impression of an open beak. Horus was often described as a ‘child’ because the Valles Marineris appeared to be a finger on which he was sucking. The greatest volcano in the solar system, Olympus Mons, appeared in the forehead of this deitys face like a ‘third eye.’ This was the origin of the placement of an adornment on the forehead in many eastern religions, and probably also of the placement of the smudge in the Christian catholic celebration of Ash Wednesday. 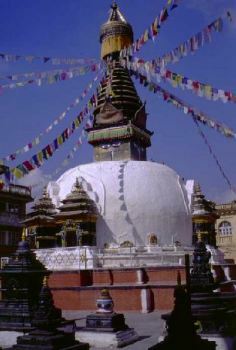 The volcanos inspired the eyes on the sides of the Tibetan Stupas (Figure 5), which represents priori-Mars. The mast on the top represents the dominant volcanic feature on priori-Mars, called Prajapati (Vedic), Brahma (Hindu), Zeus (Greek) and Osiris (Egyptian). It formed from a myriad of hardened lava tubes at the north pole and extended perhaps a kilometer into the air. Projecting downward toward the Earth it was partially supported by the tidal force of the Earth. It collapsed repeatedly when convulsions wracked priori-Mars, only to be rebuilt again. This is how the heavier rock, which is normally deeper in the planet turned out to be on the surface. The rubble from these collapses comprises the strewn fields which extend to the horizon in the panoramic images returned from both Viking landers. Note that the eyes are around the sides and not at the apex. This is consistent with the V/A theory that the axis of rotation of priori- Mars, located in the northern plains hemisphere, faced toward the Earth during the dance encounters. The eyes are painted on all four sides to simulate the rotation of priori-Mars. Egyptians and Greeks were not the only cultures to see a great curved beak on priori-Mars during the dance encounters. 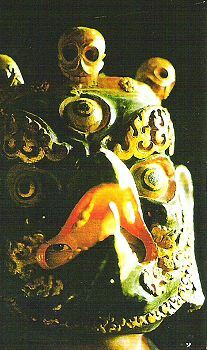 The bird's head mask from Bhutan, shown in Figure 6, is also characterized by a prominent open beak. Confirmation of our interpretation of this as a Mars deity is supplied by the third eye positioned in the forehead, representing Olympus Mons. 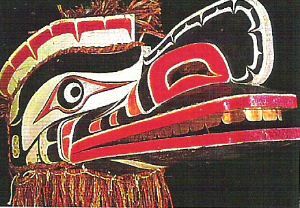 The form of a beak also appears in the carved masks and totem poles of the Kwakiutl Hamatsa Indians of western Canada. Figure 7 shows a mask representing their 'Crooked Beak of the Sky,’ currently on display at the University of British Columbia Museum of Archaeology. It is particularly interesting that the beak is described as 'crooked.’ This is consistent with the offcenter location of the Tharsis Bulge, the collapsed form of the beak. In addition, the Vallis Marineris, which constituted the 'opening' in the beak, is not symmetrically positioned. If these people had just 'invented' an imaginary sky god, they would certainly not have made it ‘crooked.’ It was because they were reproducing what they saw on priori-Mars that they made it match as closely as possible. The whole globe of priori-Mars resembled a lion head, with the area now called the northern plains being the face and the southern highlands being the mane. This was the inspiration for the many lion heads in ancient Egypt and Tibet. Many egyptologists believe that the original head of the great sphinx was that of a lion. This is consistent with the fact that it faced east, in the direction of priori- Mars, which remained stationary over the Himalayas during the dance encounters. Another ‘feature’ of Mars which was described in the Vedas was the dual deity Yami-Yama. This was also a priori-Mars incarnation. It was said to be the deity which received the souls of the dead when near the Earth and delivered them to the gods, the stars, when it left. It was described as as ‘a green man with a red cloak.’ This imples that a portion of the surface of priori-Mars, now known as the southern highlands, was still covered with vegetation during the Vedic period, while the red cloak referred to the northern plains where all the volcanic eruptions took place. This was the origin of the dual nature of the deity. 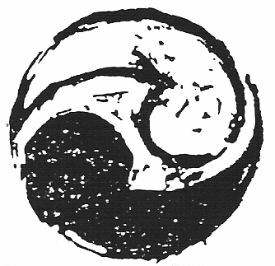 Another indication of this surface duality appears in the Chinese Yin-Yang symbol, in Figure 8. 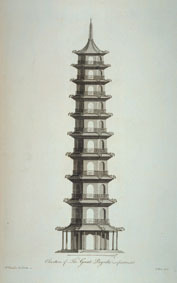 The Chinese pagoda represents the now collapsed lava fountain feature, which was the primary deity in almost every eastern religion. This was Prajapati (Vedic), Brahma (Hindu), Osiris (Egyptian), Buddha, and Zeus (Greek). Brahma was said to have four or five heads, due to separate planes of glowing liquid minerals suspended at its top. These multiple layers are represented by the stacked protruding roofs of the pagoda, Figure 9. Note the similarity of the pagoda and the Egyptian Tet symbol, which represent the same feature on priori-Mars. Lastly, Yama was said to have two dogs which circled him and acted as sentinels. These were the tiny satellites of Mars, Phobos and Diemos. The former, pictured in Figure 10, certainly gives the impression of a dog’s head. The parallels of mythical images and the features on Mars are practically innumerable. Many more are discussed in Firmament and Chaos. Please take the time to read them completely because the sheer number of interlocking facts is what really makes the strongest case for our theory of recent planetary chaos.